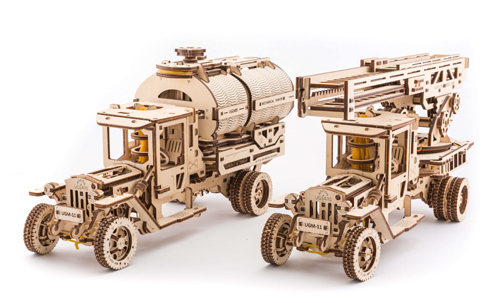 On Indiegogo we present the newest UGEAR Truck Series with 3 Additions - Tanker, Rescue Ladder, Trailer Shassis and Mechanical Flower - a new generation of our mechanical models with more technical elements and details that make it even more exciting. The Additions easily transform your Truck into Tanker & Rescue& Fire Truck. Having 3 Trucks with a Set of Additions you will create your own auto park with Rescue& Fire Truck, Tanker and Truck with Trailer. The Rescue Ladder works like in a real Rescue& Fire Truck. The Ladder is put forward, the foot is turned. Ascend the ladder and you’ll get a real crane with hook. The Tanker is equipped with the unique opening mechanism. The tanker is designed and fit well for standard 0.33 L cans.The Trailer Shassis has very realistic springs which are swinging during driving. UGEARS models are the original awesome gift and hobby idea for kids and grown-ups of all ages. 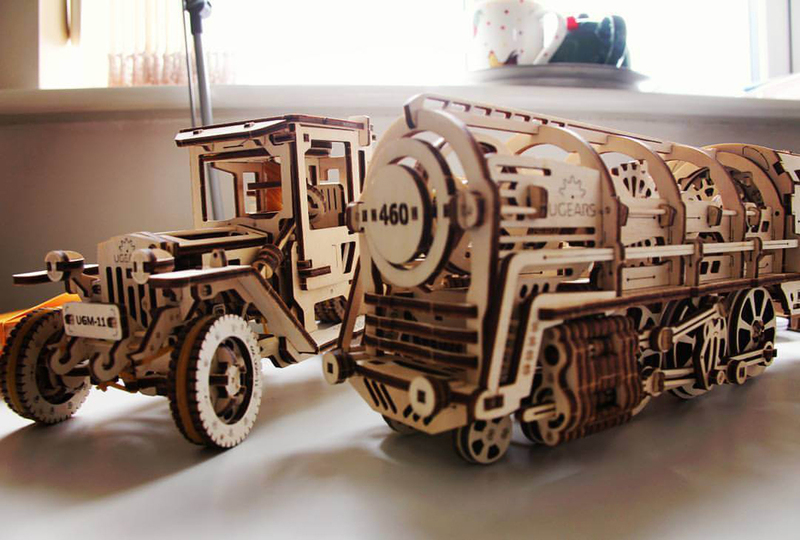 These beautiful mechanisms are made entirely of wooden materials. 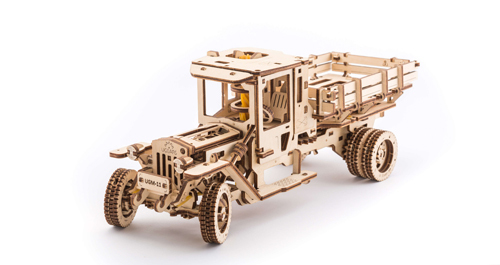 The models are self-propelled and require no electricity. It’s eco-friendly and very cool. No glue and special tools are needed for putting the models together. Fully assembled, the models are moving! Also, it's unforgettable time which you share with your beloved ones making real things together. It’s the exclusive models that can appear in the homes of those who assembled them with their own hands. We put special meaning and ideas in every model. It’s not just constructors but the pieces of art, real mechanisms that bring the beautiful world of mechanics closer and make it more comprehensible. Today we have a team of more than 40 enthusiastic people. They invest their creativity and love in their craft which you receive in each of the models. 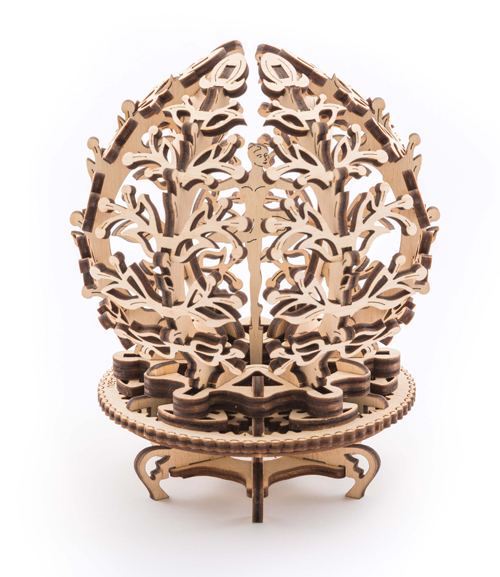 Today the product line of UGEARS includes more than 14 models. And that’s only the start. We are constantly growing and developing. 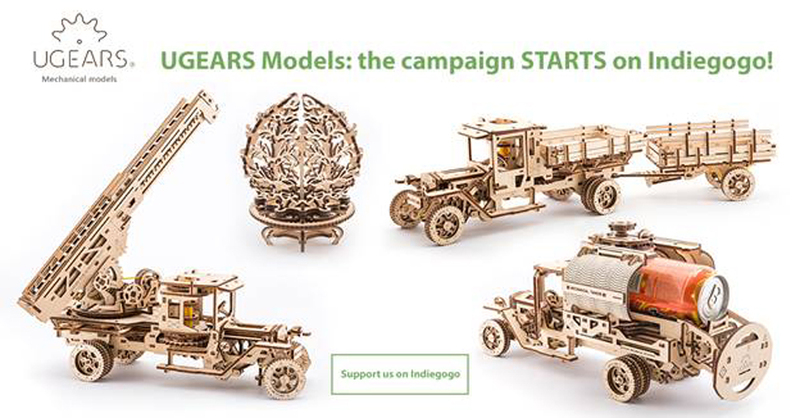 Reinforcing the success of our recent Kickstarter campaign we have launched the newest and coolest Ugears models on Indiegogo. We are going to hire more designers and release new models. We have a list of more than 100 ideas that we plan to realize. It takes from two months to a year to design a new model. 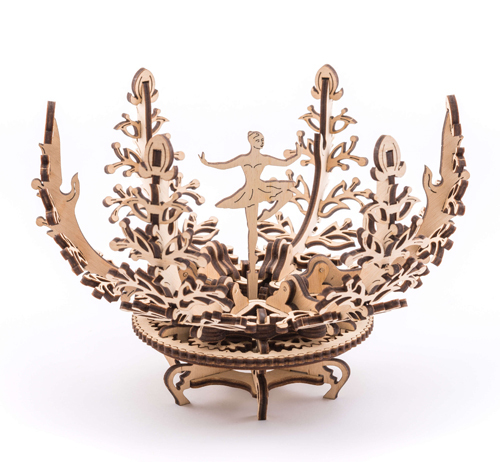 We believe that crowdfunding is the best way to expand the audience interested in the innovational products. Gadgets and videogames aren’t everything – people of all ages from all over the world still love assembling the models, seeking that rewarding feeling of constructing something with their own hands, inviting their kids and grandkids into the awesome (and admittedly old-school but yet so cool) world of mechanics! Help us to spread the word and share it with your friends. Join us in bringing these unforgettable moments to DIYers of all ages!